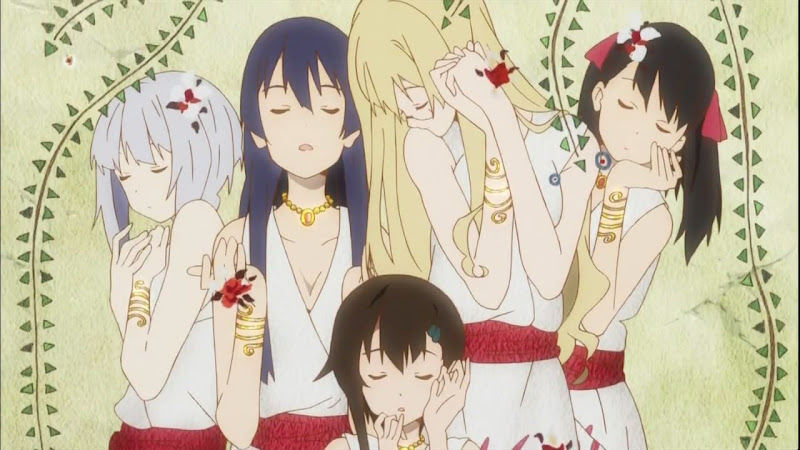 Sora No Woto is a series that, from the premise, attempted to unite the two feuding cults of Anime fans by combining traditional moe elements with a serious and compelling story line. 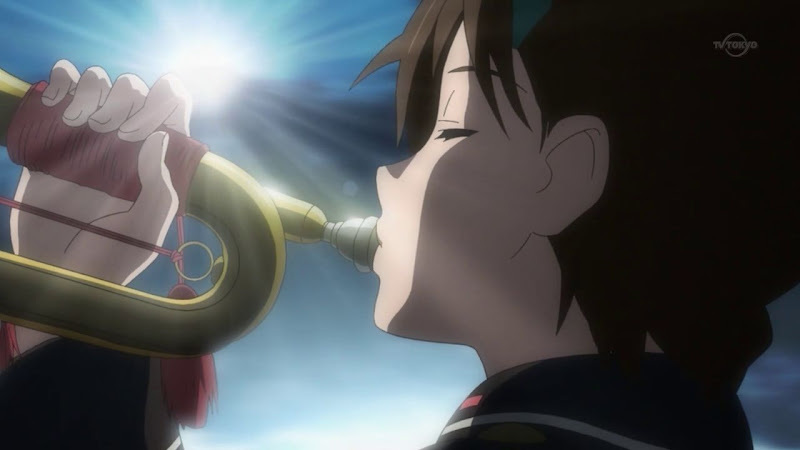 The result is a story about a young girl, Kanata, who joins the army in order to learn to play music. She is assigned to a post in the most remote part of the nation and ends up living a life of leisure in a world that has been decimated by war. Although the production values of Sora No Woto are extremely high overall the show doesn’t have a single original idea. Sora No Woto is a show crafted by committee and it shows in the most obvious places. The character designs and personality types of the main cast seem to be lifted from other popular Moe shows. The main character, Kanata, looks; acts; and has the same musical affinity as K-On!’s Yui Hirasawa and the technically inclined but soft-spoken and shy Noël Kannag is, in personality and character design, an obvious rip off of Haruhi’s Yuki Nagato. There elements give the show an artificial feel and is an obvious attempt at pandering to Moe fans. However, the world these characters are dropped into is vibrant and quickly becomes the most compelling aspect of the show. These is a mystery fueled by allusions to a great war along with obvious clues that this seemingly fantasy world the characters inhabit is, in fact, our own. The force that drives the show forward is the question, “What happened?” and that question is explored as these characters interact with the world around them. Unfortunately this element comes to work against them before the end as information given at the start of the show is proven completely false by the finale. 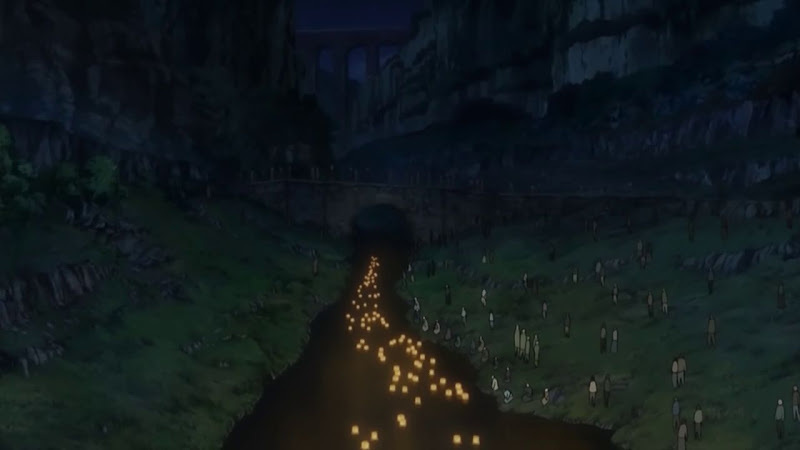 The rules of the world shift by the end of the show in order to give the show an ending climax, a lazy tactic that harms the absolute best element of Sora no Woto. Even with all these problems there still is a ton of good writing and exploration of philosophy in the series. 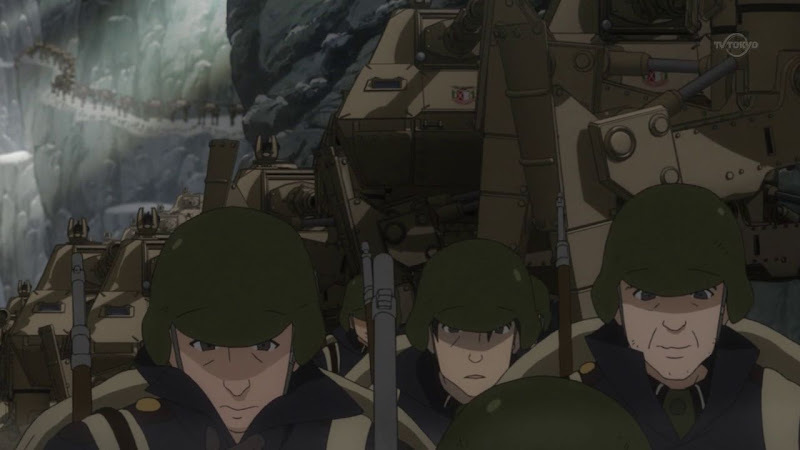 In fact, Episode 7 represents some of the best animation and storytelling to come out of Japan during the winter season. Those few good episodes are just over shadowed by the inane mindless episodes in between the building plot. The tone of the show shifts from dark and fatalistic to light and pointless from one episode to the next and the show is only good when it is exploring the darker aspects of this world. Again, this is due to Sora No Woto’s attempt to appeal to a massive audience by playing up its cute characters and Moe aimlessness. I don’t want this review to turn into Moe bashing because I do enjoy Moe when it is done right. However, Sora No Woto does it completely wrong. They play up the cuteness and flightiness of the characters in the middle of a story with real danger and serious consequences. That isn’t how Moe is supposed to work and it undermines the realism that is done well in half the episodes. As a viewer I felt myself drifting away from the series during the episodes that featured the characters in slice of life moments. There was an episode about Kanata having to wait near a phone for headquarters to call and needing to go to the bathroom for the majority of the wait. Another featured the characters wondering aimlessly through a grassy field on a “training” exercise. Of course, that focused less on anything military and more on how they managed to learn how to fish. I would have much preferred more images of the rich world than either of those pointless adventures. A three second long frame of a half destroyed Japanese class room in the second episode had more substance than both of those episodes combined. While Sora No Woto has the skeleton of a good show behind it the Moe aesthetic grafted onto it takes away from the serious and deep philosophical moments the show attempts to achieve. 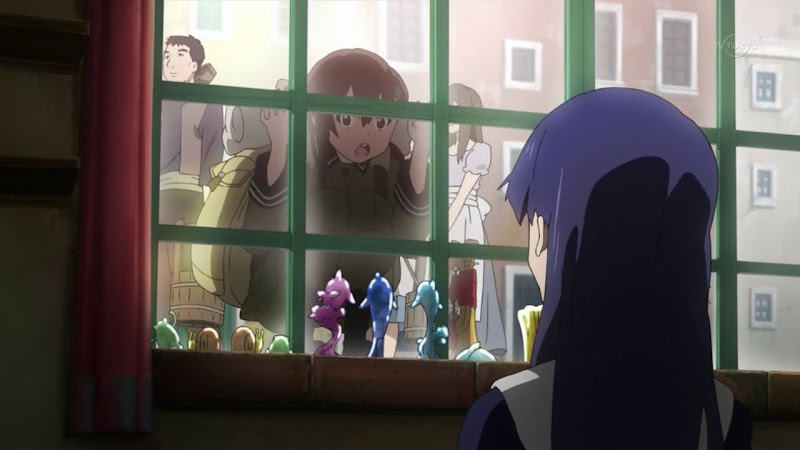 Sora No Woto works best when it is at its darkest but, unfortunately, those moments are rare and interspersed into a finely crafted marketing tool directed at Moe fans. – Finely crafted setting that adds to the plot in a passive way. – Brief moments of brilliance when the action, characters, and theme of the show are allowed advance. – Moe characters feel like carbon copies of characters from other popular Moe shows. – Nonsense “K-On!” esq episodes harm the flow and tone of the series. – Inconsistent character and world development, mismanaged plot.